My library shows have evolved from my love of books, reading and libraries. 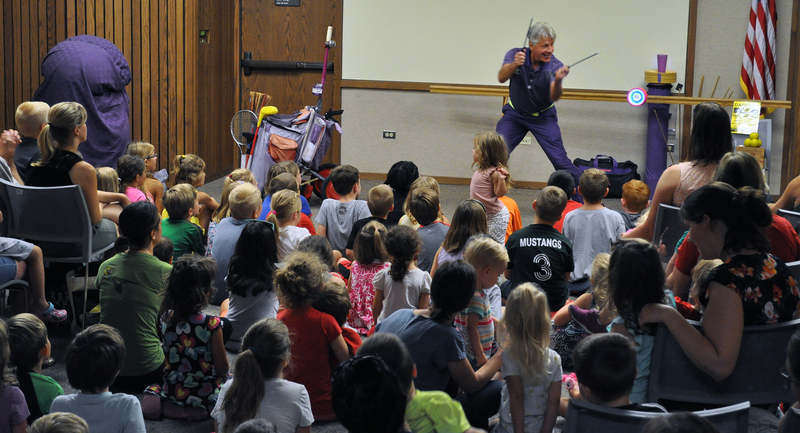 Children, parents, grandparents and babies will be amused, amazed and entertained by juggling, balancing, spinning, comedy and audience participation. Every show has a juggling lesson. Librarians appreciate my subtle yet clear message promoting books, reading and using the library. Here’s a short video from the Oak Park Library. In Read Books and Juggle Everything Else I share what motivated me to become a reader when I was young. 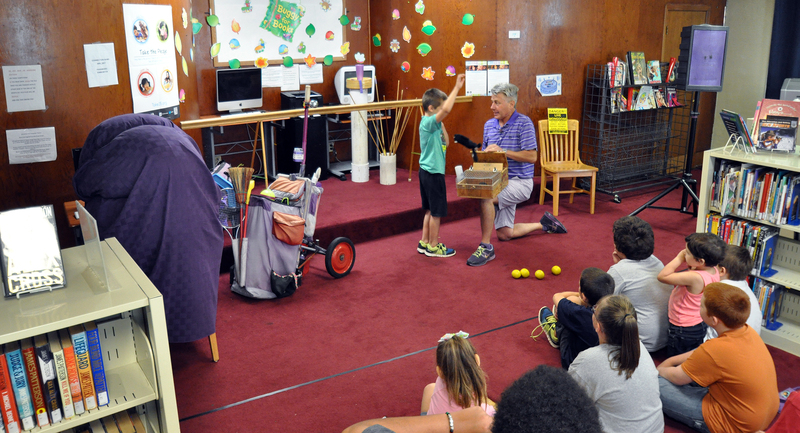 Through my juggling I touch on children’s books that I read as a child and books I’ve read to my children and grandchildren. You’ll see conventional juggling with balls and clubs. My unconventional juggling with bean bag chairs and a “live mongoose” is especially hilarious. All of this is done as an funny and compelling story. Perfect for the “It’s Showtime at Your Library!” theme. 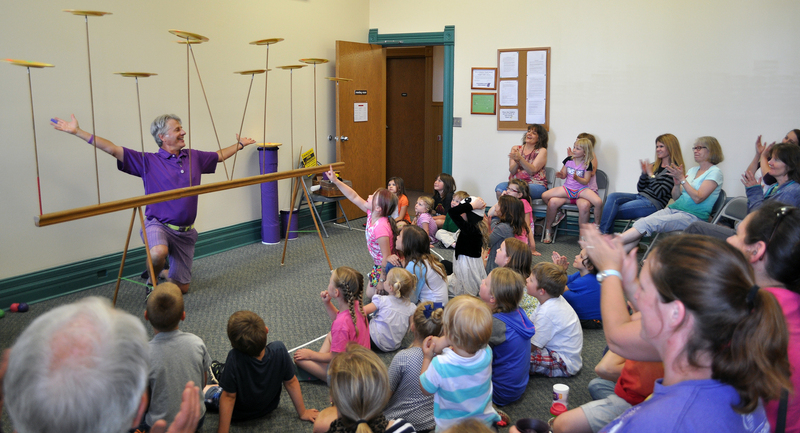 The focus of Juggling and the Science of Spin is gyroscopic force. This force, created by a bicycle’s wheels, make it possible to ride a bike. Spaceships use gyroscopes for steering and stability. I demonstrate gyroscopic force with a spinning top, a convention gyroscope, spinning plates and my favorite the kongzhu – pictured above. Another whistling kongzhu makes a dragon appear! This show is a great fit with the “Space – A Universe of Stories” theme. The finale of both shows is plate spinning. I spin ten plates accompanied by the Can Can. The audience helps by counting the plates, letting me know which ones are slowing down and counting backwards in the unlikely event that a plate should fall. This is the wild and rollicking part of the act. When all the plates are back down, I share the true story of how I learned to spin plates from a library book. Please note these shows have no danger – no fire and no sharp objects are juggled. At one point I do let the children chose what will happen next and they always chose danger. My offer to juggle a chainsaw is rejected when they discover it’s a Fisher-Price chainsaw. Instead I juggle a live (not) mongoose with the help of a brave volunteer from the audience.